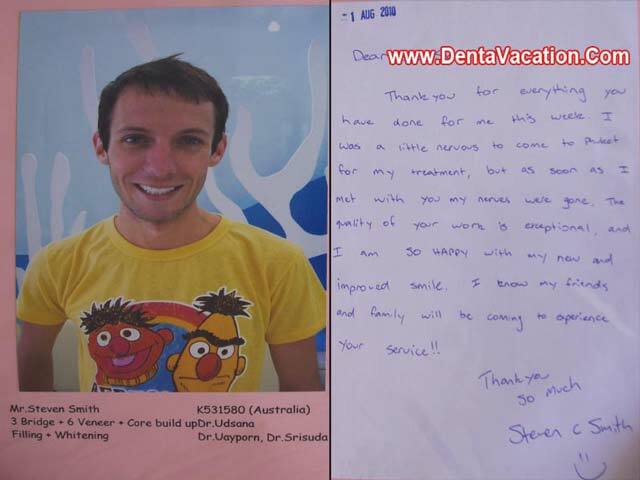 Steven C. Smith from Australia is one of the several dental tourists in Patong, Phuket who have positive things to say about their whole experience. Steven’s dental makeover comprised three dental bridges, six veneers, core build-up, filling, and whitening. This is what an upbeat Steven had to say in his review of dental job in Patong, Phuket. “Thank you for everything you have done for me this week. I was a little nervous to come to Phuket for my treatment, but as soon as I met with you my nerves were gone. The quality of your work is exceptional, and I am so happy with my new and improved smile. I know my friends and family will be coming to experience your service!! For more information and testimonials on dental work in Phuket, Thailand, fill in our free online quote form.